I am personally very happy with the Haiku in terms of its design and function. I won't belabor the details or justification of my opinion of it here. 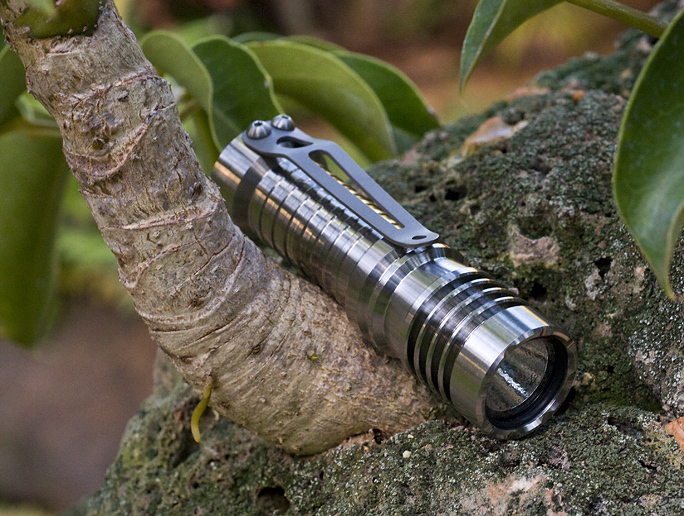 As most of you are well aware, one of the latest and greatest LED's is the Cree XP-G. I got some of these and did some bench testing as well as prototypes and felt it was worthy of inclusion in a design offering. After some time in Solid Works coupled with the bench testing, I came up with a XP-G Light Engine and a custom McR-17XP reflector combination that can be hosted by the Haiku. 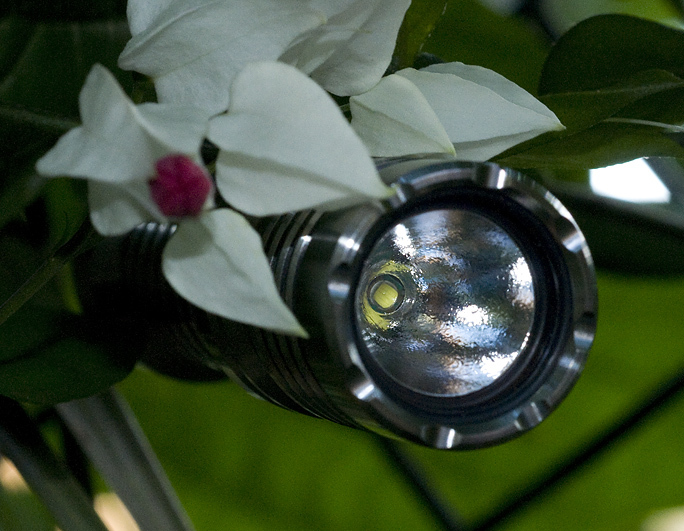 Externally, the Haiku and Haiku XP-G are the same flashlight. They both use the 3S converter with a drive level to the LED ~600 mA on high and PWM reductions in duty cycle for medium and low levels. Clearly the XP-G is a smaller package than the XR-E and it has a lower max drive current which is moot in this application as I am driving these LED's well below their capacity. 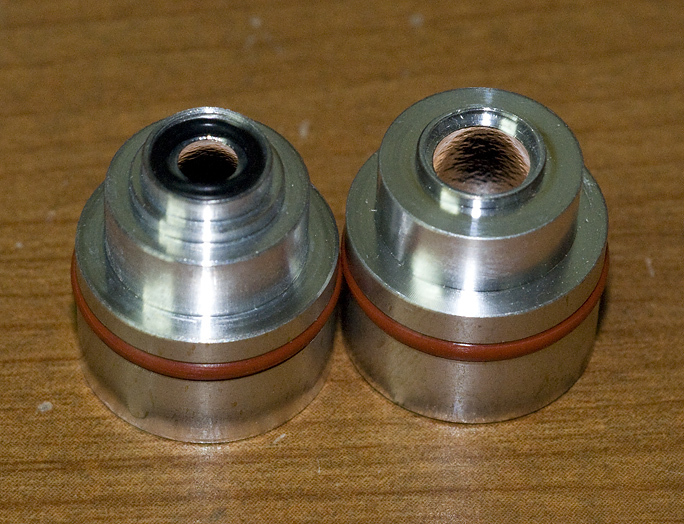 The XP-G has a larger die than the XR-E and its apparent size is even greater as you can see looking at them from the angle shown in the image above. This lends the ability to collimate and maximize lux to the XR-E but the XP-G will typically boast higher flux based on presently available bins and the direction Cree appears to be going. I had to alter the focal length of the new reflector to accommodate as well as optimize its geometry subject to the Haiku host and LED package differences. I did some comparisons between a sample Haiku and Haiku XP-G which presumably are reasonably consistent across the populations of these lights. The sample Haiku measured 138 lumens on high in my IS whereas the Haiku XP-G measured 185 lumens. The Haiku measured 3300 lux at one meter and the Haiku XP-G measured in at 2800 lux. In terms of beam pattern, the spot diamaters are similar between the two. The spill angle of the Haiku XP-G is slightly larger than that of the Hakiu and this is supported by the consideration that the XP reflector has a slightly greater spill "exit angle" which you can verify by noticing that the diameter at the front of the XP reflector is larger than that of the XR reflector and they are the same length. The spill from the XP is noticeably brighter than that of the XR and that frankly was the driving force behind my decision to go ahead with this light. On a white wall, you don't see the rings in the spill of the XP as you do in that of the XR but you can sense a slight decrease in intensity in the interior of the spot when you view the overall beam including the spill. Whether real or illusion, as soon as you use either light to illuminate a target field and concentrate on the illuminated objects, you don't percieve any of these artifacts. Based on the LED's I am using in the presently offered Haiku as well as this new Haiku XP-G I would state that Haiku has a warmer tint than that of the Haiku XP-G. 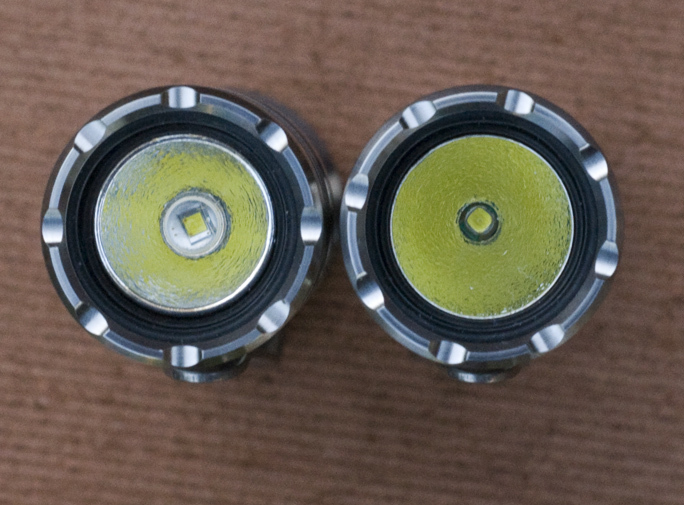 Both seem white to me but in contrast, you can see a tint difference. I don't have any plans at present to attempt meaningful beam shot comparisons as I am not confident I could produce reasonable ones nor do I want to take the time in attempting to do so. I prefer to leave the subjective comments and observations to you guys as much as possible! In terms of run time comparisons, they would really be a function of the Vf of the actual LED's used in measurement and Cree LED's vary significantly enough in Vf with no bin information. Run time should be similar is about all I can say. The Haiku's presently being offered are of XR-E Q5 flux bin and the first wave of the Haiku XP-G is of R5 flux bin. This first wave will be launched in the next day or so. When it's all said and done, I personally don't consider the XP-G as a clear winner or next generation replacement of the XR-E. Both have their obvious advantages but short comings as well. Ultimately the application and intended distribution of light could well favor one LED over the other. Based on my personal preferences, I consider the Haiku XP-G an improvement over the Haiku but not by any significant margin. My bias is based on the increase in flux and as importantly, how it is distributed. I was planning on getting a normal Haiku, then this is released! Man, I would love to see some comparison beam shots between the two, Don!! In the spirit of full disclosure and no desire to disappoint anyone, I need to point out that the way the Haiku XP-G is assembled and due to the "hands off" approach to any real hard contact with the LED, the LED is not perfectly centered down there at the bottom of the reflector. For any of you who are perfectionists and know you will be frustrated if you look down there under a magnifying glass and witness an off center LED, do yourself and me a favor and pass on one of these. darn murphy.. lurkers like him should be banned! I hope there will be more than one run of these and I'm looking forward to read commentaries from people who own a Haiku XR-E tomake comparisons! I don't really have any plans at this point. I have no reason not to attempt a standing wave but it will depend on the demand and time frame. I only got 50 of the LED's this time around and no idea on lead time to get more. I have plenty reflectors and a good number of the custom MCPCB's. I will have a much better idea of what I should consider once some of these get out and we get some feedback on them. Hey Don, any plans on just the light engine? Watching with great anticipation - I will purchase one of these without hesitation as soon as they are released!! Well well. I was wondering how you were going to address the discontinuation of the XR-E emitter. Looks good. While I was never a fan of the integrated optic on the XR-E, I gotta say the centering ring was certainly a handy addition. I was kinda hoping Cree was going to make a version of the XP emitters with a centering ring too, even if there was no lense glued on top of it. Not having that certainly does make it harder to reliably center reflectors perfectly; you'd basically need to have a square cutout on the back of the reflector that could surround the entire PCB that the emitter is attached to, if you wanted it to come out just right every time, but manufacturing reflectors with square cutouts like that would probably be a lot more expensive. Will the McR-17XP reflectors be available for sale in the usual places, so those of us with older LEs can upgrade in the future when all the large-format emitters are dead and gone? The problem is each of them has its own customised reflector? Last edited by Ny0ng1; 01-06-2010 at 09:30 AM. Actually, this has me wondering: would the McR-17XP reflector also be suitable for use with the UV light engine? 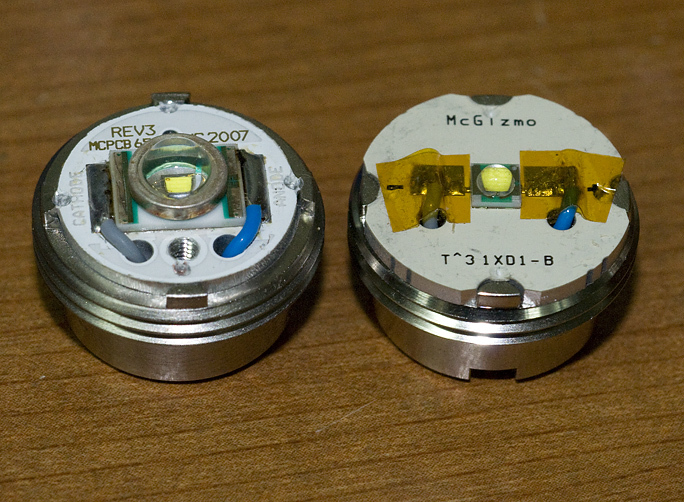 It seems like it might, because the smaller aperture would more closely match the size of the die in the UV emitter. It also appears to be the same size (or close) to the aperture in the Lunasol 20 reflector, which makes me think it could also work with Golden Dragon emitters. This actually opens up a whole bunch of options for different emitters, provided there is sufficient clearance for the emitters to fit behind the reflector. The light engine is pretty cool in a mule head as well as the original SunDrop Head. It works in the SunDrop XR-U head but at a loss of useful light given the distance from the lens. I suspect at some point I might well be offering various light engines up separately but that wouldn't come to pass until I had more on hand than I needed for complete light offerings. At the moment, I am focused elsewhere. Heck, I need to build more of these Haiku XP-G so I can get a wave up. I just got these reflectors in last week and I have not had a chance to play with them and other LED's. 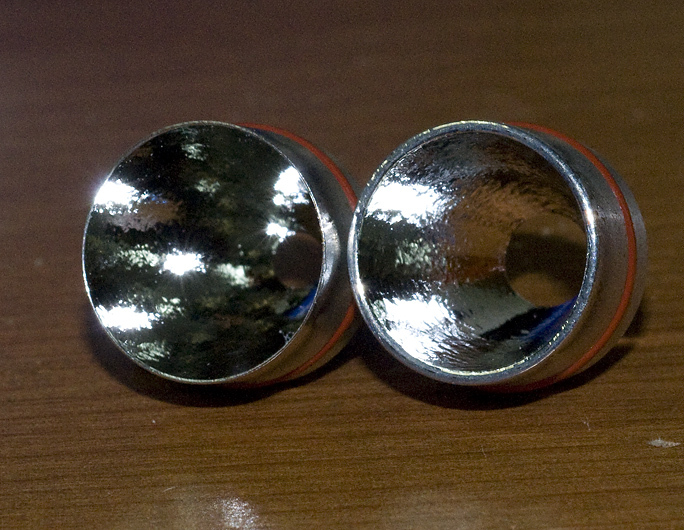 I have some Nichia 119's that I think might be interesting with this reflector. I designed and purchased these reflectors with my own use in mind and not in quantities or with intent on spreading them out to others as had been the case in years past. Times have changed. I do want to keep as many options open as possible but I also have to be aware of "the market" and my ability to survive in it. I have hundreds of the McR-17XR on hand right now as well as a good supply of XR-E's mounted on MCPCB's. To some extent and based on the interest in the XP-G, these XR components might be joining a bunch of other out of date inventory on my shelf. With that in mind, I did not order a surplus of these new reflectors or LED's for that matter. This looks great, Don! I can't wait to see how the (McR17xp +xp-g) compares to the (McR17xr + xr-e). The new light looks good! I have two questions. -Is the tint of the XP-G as cool as the Osram in the LS20 or is it somewhere between the XR-E Haiku and the LS20? -Any thoughts for doing a mizer version? I'm not sure if I need a 30% increase in lumens since the XR-E is bright enough for me already, but a 30% increase in runtime would be pretty nice. Hey Don, will these be available in the bead blasted flavour?? Initially I want to keep this simple and down to one flavor with hopefully enough inventory of complete lights available for immediate shipment. I can't say for sure since I haven't seen one of these, but the R5 light that I have is much warmer than the LS20; the LS20 seems to be somewhere between 8000-10000K, whereas the R5 I have is roughly the same temperature as an R2. I wonder where Don managed to get the Golden Dragons he used in the LS20, actually, because the couple I have on-hand are nowhere near that cool. I am here because this is a simple forum with great lights for KISS guys. Still a relatively new collector, but I have still discovered a remarkable pleasure and satisfaction in the 'KISS' philosophy of flashaholism. All the concerns about lumens, blah blah, pale in comparison to the satisfaction of owning a simple, durable tool that just plain works - every time you need it. Don's lights do that better - at least for me - than any of the others I've tried or use. What he said... ^^^ well put.